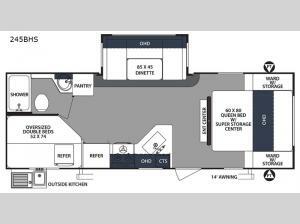 Your family of eight will enjoy all of the space throughout this single slide out Surveyor 245BHS travel trailer. Sleeping space can be found in the front private bedroom for mom and dad with a queen bed that has a super storage center below it, the rear oversized double bunks for the kids, and if needed the U-shaped dinette can easily convert into additional sleeping space. Throughout this model there are Shaker style cabinets plus more storage can be found with the two wardrobes in the bedroom. 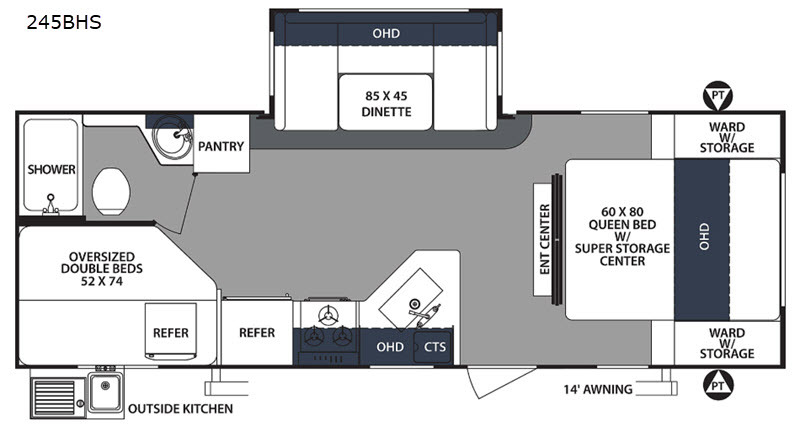 Outside there is a front pass-through storage area and an outside kitchen where you can fix your evening meal. The 14' electric awning with LED lights provides plenty of shade and gives you more outdoor living space!